Amy Lawson of Swanton rolled a 478 series total during a match versus Delta last Monday. She added a 386 series in Friday’s win over Evergreen. 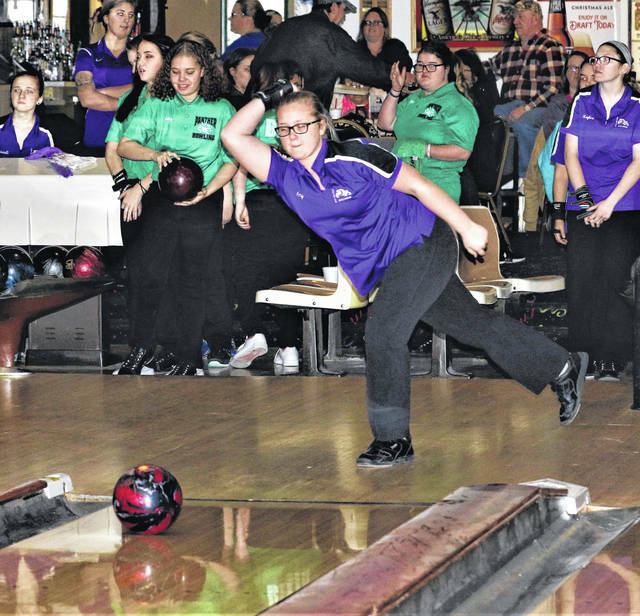 Swanton bowling swept Delta in a match at Swanton Sports Center last Monday. The Bulldog boys won by a 2,219-1,869 final, while the girls won 2,219-1,729. Derek Floyd and Aaron Futch each rolled a 397 series for the Swanton boys. Michael Lawniczak added a 341, Riley Blankenship 334 and Alexander Hicks 318. The Delta boys got a 329 from Cory Waugh. For the Bulldog girls, Amy Lawson rolled a 478. Ivy Serres was next highest with a 336. Delta’s Alli Hite had a 325, Echo Sniegowski 321, and Alexa Tenney 236. Swanton then split a match with Evergreen on Friday. The girls were victorious 2,074-1,658, while the boys fell 2,123-1,997. Lawson rolled a 386 series total to lead the Bulldog girls. Trinity Proehl added a 352 series and Kylie Ulch 336. In the boys match, Devon Crouse led Swanton with a 342. Floyd was next with a 341, Futch 277, and Hicks 258. CJ Langenderfer had a 364 for Evergreen, Ethan Shively 346, Wil Newcomb 323 and Cade Johnson 291. Swanton is on the road to face Liberty Center this Friday. Evergreen welcomes Wauseon to Swanton Sports Center.